Take it from someone who used to work for an airline, at one time travel was my living, I assisted key agencies in their vacation bookings for a major airline, and let me tell you when it comes to Travel you want to shop smarter and not harder. I had to live and breathe air fares and hotel rates for top resorts, this was a bit before the dot-com boom turned anyone with a computer into a travel agent, and agencies relied very heavily on our team to get them the best fares possible. One site I have frequented since its inception is Expedia. Did you know that their parent company owns upwards of 140 dot-com travel sites? I won't list them all here (it's actually a top result if you google them), and with that many travel sites under their umbrella, they are serious about getting their customers the best possible fare! What are the advantages of booking your trip online (like with Expedia) vs an agency? One of the top ones butterflies is accountability. And I can tell you first hand after having trips go wrong that I booked with agencies, it's hard to get them on the phone after their business hours end in their time zone. Expedia will assist you if you run into a problem. They offer 24 hour Customer Support. They also offer a Best Price Guarantee (which I have yet to receive via a traditional brick and mortar agency). And if that wasn't enough to sway you, you can also download their Fare Alert tool which will email YOU about the prices of flight destinations you are tracking. That's a great tool not only for business travelers who tend to frequent the same cities, but destination and resort travelers who also like to regularly visit a particular location. Expedia has partnered with Savings.com to host a giveaway where Three (3) winners will each receive $1,000 Visa Gift Cards! 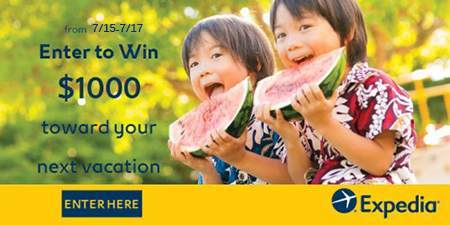 You can enter the giveaway by heading to the Expedia Page on Savings.com and submitting your email address on the form at the top of the page! But ACT FAST dear butterfly as this giveaway runs from Tuesday, July 15th (TODAY) at 9:00 AM ET to Thursday, July 17th at 9:00 PM ET. Winners will be chosen via a Lottery drawing on Friday 07/18/14 and will be notified via the email address they used to enter! You know just how much #TheOfficialTwitterPartyDJ loves her twitter parties right? Well there is going to be a Twitter Party using the hashtag #TravelOnUs on Wednesday, July 16th at 1:00 PM ET with THREE (3) $100 Visa Gift Card Prizes! RSVP HERE! - Just note butterflies, I am neither a host or co-host for this party so please direct questions directly to the hosts. I, like you will be there for the great conversation, because when it comes to combining my two passions travel and twitter, I'm in it to WIN it! Feel free to tweet me a hello, I'll be tweeting from my personal handle @Tracy_Iglesias and will only use the @Ascending1 handle if I get thrown in twitter jail for oversharing! I love that Expedia offers 24/7 Customer Service Support! I learned the hard way on the very last trip I ever booked via an agency that accountability and being able to reach an actual human being is important. I booked an international trip (pre-Expedia of course!) via a Brick and Mortar Travel Agency and when I arrived at my Resort there was confusion about my confirmed room type and even my printed itinerary from the Agency wasn't enough to solve the problem. The hotel manager wasn't helpful and when I got back the agency attitude was 'well did you get a room?, then everything is OK right?' - UM NO!!!! Take it from an airline industry insider, leave the fare finding to a pro, in this case Expedia and have more time to sit back, relax and enjoy the view. They say it's not the destination but it's the journey right? Well as for me, I want that journey to be smooth and that destination to be five star! If you win that $1,000 Visa Giftcard, where will you travel to Butterfly? FTC Disclosure: This post is sponsored by Savings.com. I am disclosing this in accordance with the Federal Trade Commission 16 CFR, Part 255 - Guides Concerning the use of endorsements and testimonials in advertising, you may check our Giveaway and Disclosure Page for additional information regarding Ascending Butterfly Disclosure. OMG ! I'm I love to travel and I sure do love to save so here go's hope I win !! I have never used Expedia what a great way to get to get acquainted with there service. What a great site you have. I can't wait to delve in further and find some good vacation ideas. I've had good experiences with Experia when booking more than just flights. I had a hotel mishap, and because I had my printouts from Expedia - every thing was taken cared of in a relatively quick manner. Expedia rocks! I use them all the time! Great post! I want to travel to costa rica!! I will take the honeymoon I never had. Just 9 years later.